The research problem focused on Panama's low-income consumers' decision making process when shopping for consumer-products. 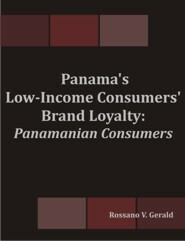 The purpose of the research was to determine Panama's low-income consumers' consumption values, preferences, and loyalty towards a particular brand over another. The qualitative research method was employed in this study, and the data collection process consisted of observation and in-depth interview documents that were organized and categorized. The results of the study found that Panama's low-income consumers' brand preferences were widely varied and brand-loyalty behavior was influenced by consumers' knowledge, perceptions, and commitment towards a particular product and service provider. Recommendation for further study addressed the marketing strategy that could be used to identify consumers' consumption preferences and loyalty towards a particular brand.